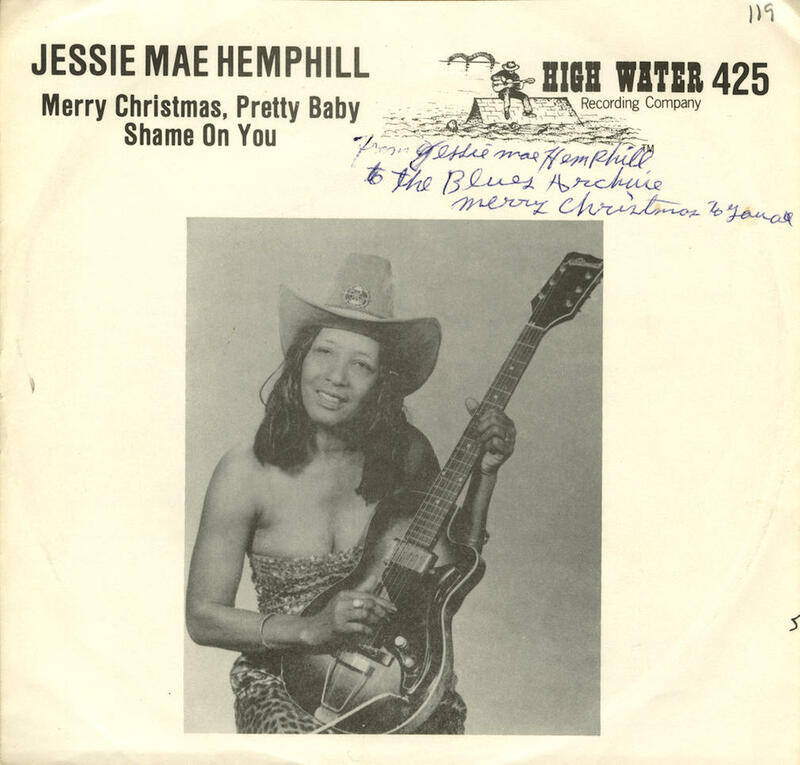 Singer, guitarist, percussionist, and songwriter Jessie Mae Hemphill was born between Como and Senatobia, near the Tate-Panola County line, in 1923. (It was believed for many years that she was born much later, in 1933 or 1934.) Her family had a long musical tradition, contributing to her multi-instrumental abilities and the richness of her North Mississippi hill country sound. Hemphill’s great-grandfather, Dock Hemphill, was a fairly well-known fiddle player from the area around Ackerman. In 1942 Library of Congress folklorist Alan Lomax recorded her grandfather, Sid Hemphill, performing ballads, country dance tunes, and spirituals on various instruments, such as a cane fife, quills (pan pipes), banjo, drums, and fiddle. Jessie Mae Hemphill’s mother, Virgie Lee, and two aunts, Rosa Lee Hill and Sidney Lee, sang, played various string instruments, and played drums at family picnics. Jessie Mae’s father played piano. Like many in her family, Jessie Mae began performing on bass and snare drum with African American fife and drum ensembles for community picnics. Sid Hemphill and Rosa Lee Hill taught Jessie Mae to play the guitar, which she used to accompany her singing at church gatherings and other functions. Like her grandfather and other musicians from this region, Hemphill played the one-string guitar, better known as the diddley bow. Although she played some Chicago- and Delta-style blues, Hemphill’s overall musical style was rooted in the North Mississippi hill country tradition: strong, repetitive dance rhythms (which she called the “hypnotic boogie”) and little harmonic variation outside a single tonal center. She sang gospel, spiritual, blues, and original songs to distinct hill country guitar accompaniments, often backed by a tambourine or bells attached to her foot. Although Hemphill played semiprofessionally in Memphis and the Mississippi Delta in the 1950s and 1960s, she failed to garner extraregional attention for another thirty years. To supplement her performing, Hemphill supported herself by cleaning houses and working in cafeterias and grocery stores. In the 1970s, at the suggestion and with the help of University of Memphis ethnomusicologist David Evans, Hemphill ventured toward a more professional musical career, performing across the United States, Canada, and throughout Europe. Her first recordings were released in 1979 as a set of singles Evans produced for the University of Memphis’s High Water Records label. Hemphill’s first album, She-Wolf, was released by the French label Vogue in 1980. A 1993 stroke resulted in partial paralysis of her left side, slowing Hemphill’s performing and recording schedules. Nevertheless, she appeared on several more recordings, including Richard Johnston’s Foot Hill Stomp (2002) and the collaborative tribute album Dare You to Do It Again (2004). Hemphill received four 1991 W. C. Handy Awards for Traditional Blues Female Artist and Best Country Blues Album for Feelin’ Good. She died on 22 July 2006.